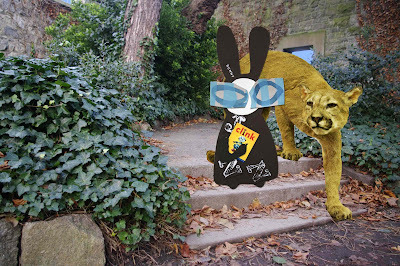 Puma fell into step with the Wabbit's hop and purred, "Hello Wabbit!" "I didn't know anyone else knew this place," said the Wabbit. "I often prowl these parts," said Puma and he stretched a bit. "I call this the Secret Garden and I come here to read," said the Wabbit.”I found this book in a small shop near the Corso Spezia market." Puma scrutinised the Wabbit's book. "That looks like a children's book," he exclaimed. "There's lots of information in children's books," said the Wabbit. "What information?" asked Puma. "Things they don't tell you anywhere else," said the Wabbit. The Puma thought that was very amusing and he gave a low growl of delight. "Really Puma, this is a lovely tale of an excluded robot who is befriended by a small boy," said the Wabbit seriously. "Ha! It's about relationships," said Puma. The Wabbit struck his book with a paw. "We remain largely uninformed about good relationships," he said. "Because we only talk about bad ones," replied Puma. "That's a gloomy thought," said the Wabbit. "I don't know," said Puma. "Perhaps someone will someday write a book about our relationships." He rested two paws on the steps and came close to smiling. "Oh, who could be bothered to write about us?" said the Wabbit. "We could be bothered," said Puma. "So let’s go over by the trees and write our own book." "But how shall we start?" asked the Wabbit. "Once upon a time," said Puma.